I heard a familiar sound clip on the radio on my way to work--entertainer Andy Kaufman's "Thank you very much." This was nothing new; radio stations make use of movie and TV sound clips sometimes, though I can't say I've ever heard anyone use that one before. 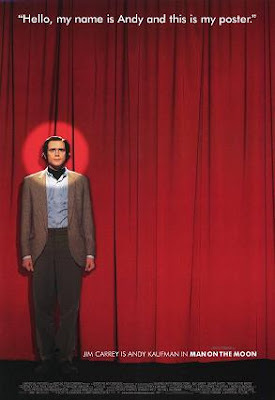 I kept listening, expecting an announcer to come on or music to play, but then Jim Carrey started quoting lines from what I quickly identified as the 1999 movie Man on the Moon, in which he plays Andy Kaufman. OK, so they were playing a few sound clips from the movie for some reason. Hang on--they were playing the entire 60-second radio commercial for the movie. I'm pretty sure I was doing the speed limit the whole way to work, as I don't recall hitting 88 miles an hour and traveling back to 1999. The commercial was followed by an announcement of the year the commercial was from, and a return to regular music programming with R.E.M. 's "Man on the Moon," which I suspected might be up next. It's not completely uncommon to hear that particular song on the radio, but I've seldom heard anyone mention the film unless it's specifically in reference to Jim Carrey's career. Consequently, the commercial felt incredibly irrelevant, especially when acting as an introduction to a somewhat popular song that doesn't seem to warrant such an introduction. Yet for those 60 seconds, I was living in the '90s again, and I had forgotten how much I missed those days. Alex waxed nostalgic recently with Lithium, and though I'm really more of an '80s guy myself, I've got plenty of nostalgic waxing to do about the '90s as well. Yet, I have no strong associations with Man on the Moon; I remember a little bit of watching it on TV, and I still listen to selections from the soundtrack my friend got me one year, but that's the extent of it. Simply hearing an old radio commercial for this movie shouldn't have triggered a sudden compulsion to pop in a cassette tape and drive to my local FuncoLand to buy used SNES games. SOUNDS OF EXPLOSIONS AND VIOLENCE! LINES OF DIALOGUE TAKEN OUT OF CONTEXT TO MAKE THE SITUATION SEEM MORE DIRE THAN IT REALLY IS! DARK EXHORTATION TO WATCH WHAT'S BEING ADVERTISED, OR ELSE YOU WILL BE MISSING THE EVENT OF A LIFETIME! In fact, as I'm thinking about the last decade, all that's coming to mind in terms of mainstream entertainment are remakes, reboots, the color blue (I have no idea why), and music that blurs the lines between genres I do and do not like, resulting in songs that are tolerable enough to listen to, if I have to. Perhaps all this was subconsciously running through my head during those 60 seconds; the commercial was so far removed on so many levels from what I'm used to hearing anymore, and it managed to drag me away from the last several years of what I perceive to be creative stagnation and a deviation from a focus on content in the entertainment world. You don't need to tell me that the '90s weren't all sunshine and rainbow hippos. You also don't need to tell me how many wonderful advancements and new releases there have been over the last decade. This is not about rationality or fair comparisons. This is a gut reaction to a movie commercial that came out of the blue. (Out of the green, actually; the '90s feel more green to me). This decade is looking a lot more promising so far in terms of entertainment; I think we needed to get whatever it was out of our systems that was preventing us from embracing our past, looking forward to the future, and keeping us mired in the present. Too much of a "future is now" mentality, perhaps. Me? I'm content to live in the past and get caught up with the present once it's been around long enough to know what's worth catching up on.